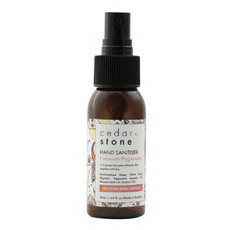 Get your hands Squeakie clean with this 100% natural hand sanitiser. It helps to protects from 99.99% of germs while also complying with the World Health Organisation (WHO) and Centre for Disease Control (CDC) hand sanitiser guidelines. 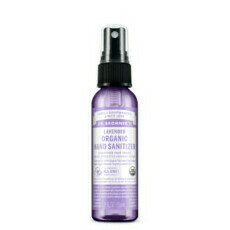 This nourishing formula uses a unique combination of natural ingredients including 62% Pure Milk Whey Alcohol, Sea Kelp, Rosehip Oil and Aloe Vera to kill bacteria without drying out the hands. 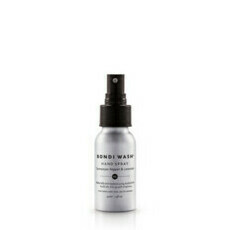 Suitable for all skin types including children and sensitive skin. Packaged in a recyclable, BPA-free bottle. Made in Australia. Palm Oil Free. Not tested on animals. Pure milk whey alcohol (squeakie’s active antibacterial agent), purified water, bladderwrack extract, rosehip oil, aloe vera, omega 9, lime essential oil, palmarosa essential oil, cellulose gum, vegetable glycerine (palm oil free). Found it didn't irritate my eczema-prone skin unlike so many other sanitisers. The clip on is a big bonus! Very handy, has a clip so you can clip it to your bag, pram ect for easy access. Smells great! 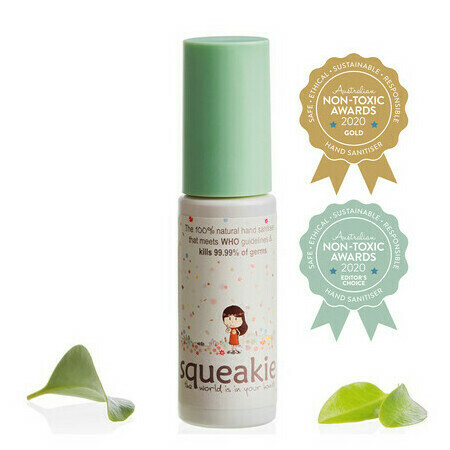 Find out more about the Squeakie brand.